I love this little breakfast joint near me called Jim’s Open Kitchen Too. The whole staff is always happy and working hard. It may be the best culture of anyplace I’ve ever been to. A friend emphatically told me to try it out. It was word of mouth that got me there. They remembered my daughter Felicity’s name a week after our first visit. The food is consistently good, it has the mark of people who care. Over easy means over easy. Yes, it’s simple breakfast fare, but it’s done with excellence. 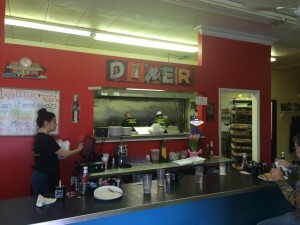 The kitchen staff frequently bursts into song, singing along with the jukebox. They’re only open for breakfast and lunch, 7-2. They focus on those meals and they’re good at their niche. I’ve never seen so many smiling staff. Anywhere. I’ve never seen so much hustle in a restaurant. Things fly. Everyone wears shirts that say either ‘what happens at Jim’s stays at Jim’s’ or ‘everywhere else is just a restaurant’. I have introduced at least three people to it by bringing them there. I almost always have to fight for a parking spot. I asked our waitress why they’re so happy. She said she’s worked at lots of places but loves working here. She’s been here 7 years, by far the longest at any one place. I asked if they are light on drama, she said no, but they work it out fast when something is wrong. She thinks that is the key. Could it really be that simple? Work disagreements out early? Good communication? It just might be. Two other examples came to mind, one good, and one bad. One of the best pastors I’ve had the privilege to listen to is Paul Sartarelli, who started and led Riverwood Community Chapel in Kent Ohio (it’s also where my wife and I met.) He’s a gifted leader and orator. He had a policy to lock two people in a room when they had a disagreement until they worked it out. That church has good culture, too. Looking back, poor communication is one of my failures that destroyed my contracting business. I didn’t help my employees work things out. My crew imploded 1/2/13 when they refused to work with one another. Poor communication really hurt me. It took essentially an intervention where we all aired our frustrations, apologized to each other, and promised to move on before the situation was resolved. Things got better (although I knew they were never going to be the same.) It felt like just a job after that, culture was broken. I had screwed up royally. How Does This Apply To Home Performance? From my seat here in Cleveland Ohio, I manage to hear a lot about efficiency programs across the country. One thing I have yet to hear about are a lot of smiling faces. At best, it’s usually ‘meh’. If we’re going to grow, and grow exponentially, we need to do better than that. A lot better. If I had to point to one specific place where good communication is critical, I would point to the kitchen table. This is where projects are sold. Mark Cuban says ‘sales solve everything.’ It may be a little simplistic, but there is no bottom line until there’s a top one. Until we sell something, nothing else matters. Training, crews, program administrators, equipment, trucks, office staff, and on and on – none of them have a job until we sell something. Few, if any, program designs are optimized to make communication at the kitchen table as smooth and easy as possible. Every time that is made just a little harder, contractors smile a little less. More discontent is sowed. What if making contractor lives easier, better, and more profitable by streamlining the kitchen table process was a program goal? What if they really felt like their voices were heard? What if program changes were no longer sprung on them? If Home Performance is going to scale, we need to solve the culture problem. We need stupid happy people blazing around doing good work. To solve the culture problem, we need to make things easier at the kitchen table. To do that, we need to improve communication among all the players from homeowners to public utility commissions. Everyone’s interests need to be aligned from solving homeowner problems to creating a sustainable and profitable business opportunity for contractors to saving mandated energy for programs, utilities, and public utility commissions. Program structures need to lead to good culture. Everyone can win, and everyone can do it with a smile on their face, just like Jim’s Open Kitchen. It’s a matter of creating the right culture. It is possible. Energy Smart is doing it on a very small scale currently. I enjoy my job again, culture is good. With One Knob, this same culture can be replicated at a much larger scale. By the way, the picture on the side is a picture of my daughter Felicity sitting on a stool at Jim’s. They remembered her name. This entry was posted in Culture and tagged culture, kitchen table, program dysfunction, win-win-win. Bookmark the permalink.